Top 5 Accessories for Summertime Running — Rhode Runner Inc. The number one and I mean NUMBER ONE accessory for summertime running is socks. Not just any socks, a solid running sock made of high-quality materials. A great running sock will be made of a blend of polyester threads vs your traditional cotton sock. Why, because polyester is hydrophobic (afraid of water) it will pull that water away from your feet and work with your well ventilated running shoes to keep your feet dry when the weather heats up. A cotton sock absorbs moisture (think bathroom towel) and holds on to it..the very last thing you want your socks to do…unless you like blisters? Oh, you don’t? Remember cotton is rotten when it comes to socks. Staying hydrated during the summer months is a must. There are some awesome water bottles to help you do just that. If you’re looking for something to use before or after your run Hydroflask is an awesome brand to help you get prepared for the run before you head out the door or hydrate you after your run. They keep your water cold. Like legit cold. Throw some ice cubes in there and you’ll want to drink it nice and slow to avoid brain freeze. Now if you’re heading out for a long run and you need something on the run there are some great handhelds and belts from Nathan to check out at the Rhode. The 10oz palm holder is a staple as its just enough to get you through but not so bulky that you feel like you’re carrying a weight around! Even while on the run. These are items that sometimes get overlooked by us runners. We think... well if I’m thirsty I’ll drink some water. Not so fast, when you’re out there for a run you’re losing some vital electrolytes through your sweat. Drinks like Vitalyte or Nuun will help replace these to make sure you’re not passing out after your run or before you make it home safely. They’ll contain things like sodium, potassium, magnesium and other salts that will help your body maintain its proper balance. According to the American Chemical Society, “our cells would shrivel up and die or burst from being too full” without electrolytes. Now we wouldn’t want that, would we? Nothing makes you look more badass or intimidating at that local 5k than a sweet pair of running sunglasses…unless you look like this guy. Anyway, a good pair of sunglasses can do much more than make you look cool. They protect those beautiful eyes of yours from harmful UVA and UVB rays. Continuous exposure to UVA and UVB rays…like I don’t know running every day without eye protection can lead to Macular Degeneration, cataracts and a host of other eye issues. All of the sunglasses at Rhode Runner will protect your eyes from those harmful UVA and UVB rays so put some shades on bro! Maybe this is a bit of a selfish pick for the top 5 to protect my nose. The Power Shower from Nathan is a great way to de-stench yourself after a summertime run. A lot of times you have to squeeze a run whether its at lunch or before the kids wake up from a nap and you don’t have time to also squeeze a shower in as well. 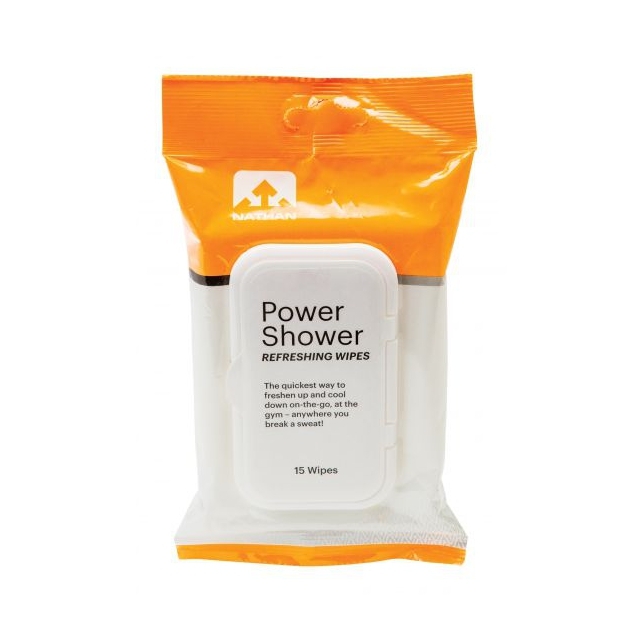 The Power Shower wipes do a great job of helping out, while not as effective as a legit shower the power shower can certainly hold you over till the next shower.